A team of archaeologists from Shanghai Museum in China recently conducted an excavation mission in Sri Lanka to find links with the ancient silk route. It happened at a time when China had launched its Belt and Road Initiative (BRI) based on the ancient silk route to improve connectivity with the rest of the world. Sri Lanka is among the countries that pledged cooperation with BRI. Q How do you see the positioning of Sri Lanka in the ancient silk route? The Maritime Silk Route starts from Chinese coastal ports, extending through Southeast Asian countries to the Indian Ocean, Red sea and then Europe and even East Africa. It has constructed an international network for trade and cultural exchanges, promoting the development of countries along the route. Located at the heart of the Indian Ocean and right in the middle of the sea route between the East and the West, Sri Lanka has played a pivotal role in the maritime trade. Links between Sri Lanka and China can be traced back to over 2000 years ago. In the 5th century, eminent Chinese monk Fa Xian spent two years in Sri Lanka studying Buddhism. From the 6th century on, exchanges between the two countries have become more and more frequent. Notably in the 15th century, Zheng He’s fleet made several stops in Sri Lanka during his voyages. People from both sides expanded trade and enhanced friendship. The trilingual inscription which was found in Galle in 1911 is important evidence of this milestone. From 2018 on, the Sino-Lanka Archaeological Project has been launched through cooperation between the Central Cultural Fund and the Shanghai Museum. A joint archaeological team has been deployed to explore the economic, cultural and religious exchanges among different countries through excavation and research of the sites and relics related to the Maritime Silk Route in Sri Lanka. Q What did you discover during excavations? During August and September this year, the Sino-Lanka Archaeological team started its first mission in Jaffna, the important port city in Northern Sri Lanka. The Allaippitti site in Kayts was excavated while a test-trench was dug inside the Kayts Fort. There are important findings, especially in the Allaippitti site. Quite a number of Chinese ceramics were found, providing significant evidence of the trade links between Sri Lanka and China. The excavated artefacts are mainly Chinese ceramics, accompanied by a few local and Southeast or South Asian pottery. The Chinese ware can be dated to the second half of the 11th century and early 12th century, in the late Northern Song dynasty in China. The majority of Chinese ware was produced in the coastal areas of Guangdong and Fujian provinces. The most identifiable pieces are products from Chaozhou and Xicun kilns in Guangdong, while a small number of sherds are from Yaozhou kiln in Northern China. In the late Song period, Guangzhou surpassed ports in Zhejiang and Fujian provinces and became the most important port for overseas trade, which definitely led to the boost of the Xicun and Chaozhou kilns for export porcelain. These excavated wares will certainly shed light on the researches of maritime routes, trade network as well as the links between Sri Lanka and China. Q What is the special reason for you to undertake your work in Jaffna? types of porcelain were found in Jaffna, so this area is an important place to understand the early Sino-Lanka relations. Q How can the two countries cooperate with each other to preserve the archaeological heritage? Cultural heritage is an historical treasure left by humans in the past. These heritages are important material to understand the interrelationships of early human civilizations, so it is first necessary to recognise their historical values through research. With the construction of the city and development of the economy, some cultural heritages are in danger of serious damage. If we do not strengthen the protection of cultural heritage, we will lose them and our memories of history forever. Therefore, we should cherish and care for them together. In recent years, China has accumulated a lot of experience in the protection of cultural heritage. If possible, the two countries can cooperate in the protection of cultural relics, the use of cultural heritage and museum management to preserve the heritage of human civilization. Q What are the areas for further archaeological explorations? Sri Lanka is an island with many important ports along the coast and a large number of remains associated with the Maritime Silk Road. The joint archaeological team will study the theme of the Maritime Silk Road and carry out archaeological investigations and excavations of relevant port areas. In addition to Jaffna, areas that may work in the future include Trincomalee and Galle. Q How do you look at the Buddhist lineage between Sri Lanka and China? Links between Sri Lanka and China can be traced backed to over 2000 years ago. This fact is not only based on the records of literature, but also confirmed by archaeological findings. 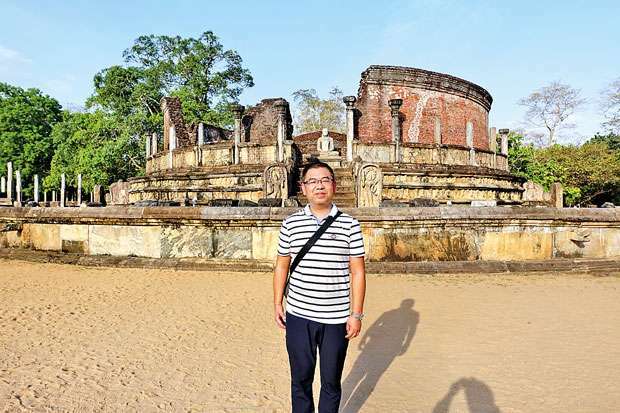 Not only in the ports of Sri Lanka, but also in urban cities like Anuradhapura and Polonnaruwa, a large number of Chinese ceramics, coins and other cultural relics have been discovered. These show that Chinese goods have always been very popular products in the maritime silk trade at that time, or in the relationship between China and Sri Lanka. The influence of different countries is not one-way. In the long history of exchanges, Sri Lanka’s Buddhist tradition has also had an impact on Chinese religious thought. According to literature, there are Buddhists who came to Sri Lanka from China like Fa-Xian and Sri Lanka had sent people to China to promote Buddhism.